My painting today is the result of experimenting with watercolor on Yupo paper. Yupo isn’t actually paper at all, but a machine-made sheet of polypropylene that artists have been experimenting with for several years now. So far, I’m a fan of Yupo and the fact that it’s non-absorbent. As paint dries on the surface, it moves around and settles in interesting patterns. I like the feeling of letting go and the slight lack of control over the finished product. Also, if you find the result unsatisfying, you can wipe it away with paper towel or smear it and make new patterns. I will most likely be sharing more paintings on Yupo in the near future. Please let me know what you think! 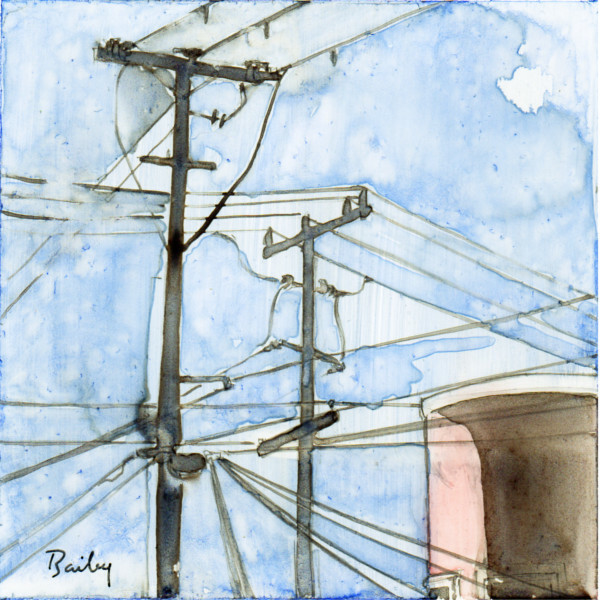 This entry was posted in Uncategorized and tagged Art, Painting, San Francisco, Watercolor, Yupo by theartofbrian. Bookmark the permalink. LOVE that so much! Looks like clouds in the sky 🙂 I’ll have to try that sometime. Great piece of work! Thank you! Yes, I would recommend trying it, there are lots of possibilities! Interesting – there’s an ad for Yupo in this month’s Watercolor artist’s magazine that I get. Cool! I look forward to seeing more. This is a nicely done piece. Thank you for your comments! I was a little unsure about posting it until I’d done a little more experimenting, but I’m glad I did. I really like this! You have me curious to try it! Thank you! I’ll definitely be experimenting more in the future. It looks almost like stained glass. It works particularly well with the architectural angles formed by the wires. Looking forward to seeing more work on this surface! Thank you! I’ve actually been working with it more today and will probably post one or two soon.